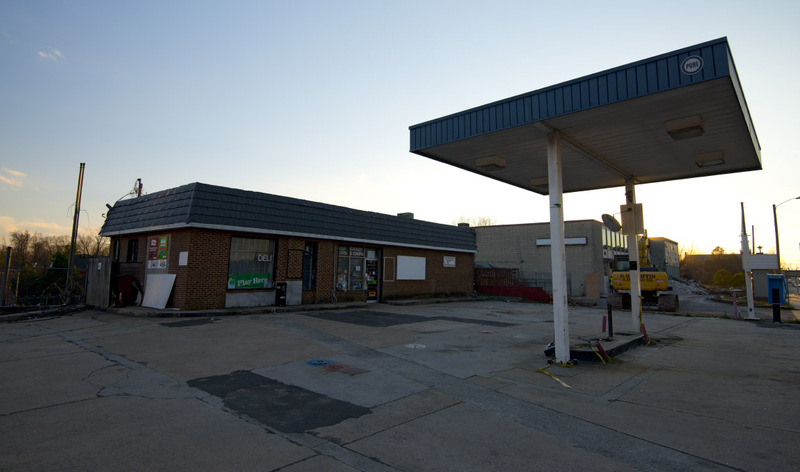 AMOCO - 601 W. CHAPEL HILL ST.
Do you know of any details about the planned development? 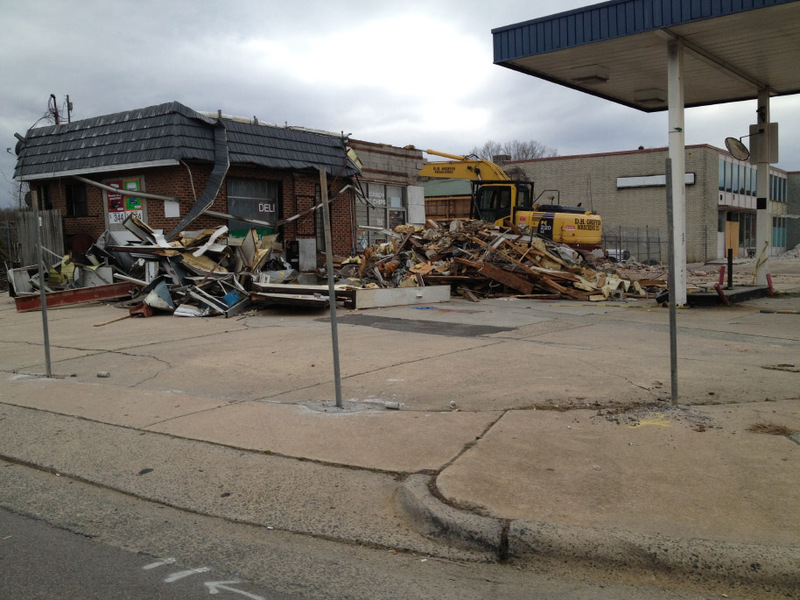 Glad to see the Sturdivant eyesore go, but after looking at EdR's website, I'm afraid what they will come up with will be newer and shinier and more gentrified, but not any better. I've studied enough Durham land use history to cast a jaundiced eye at those who say "Anything would be better!" I'm sure that's what they said when they tore down some old Victorians to build a Holiday Inn back in 1959. 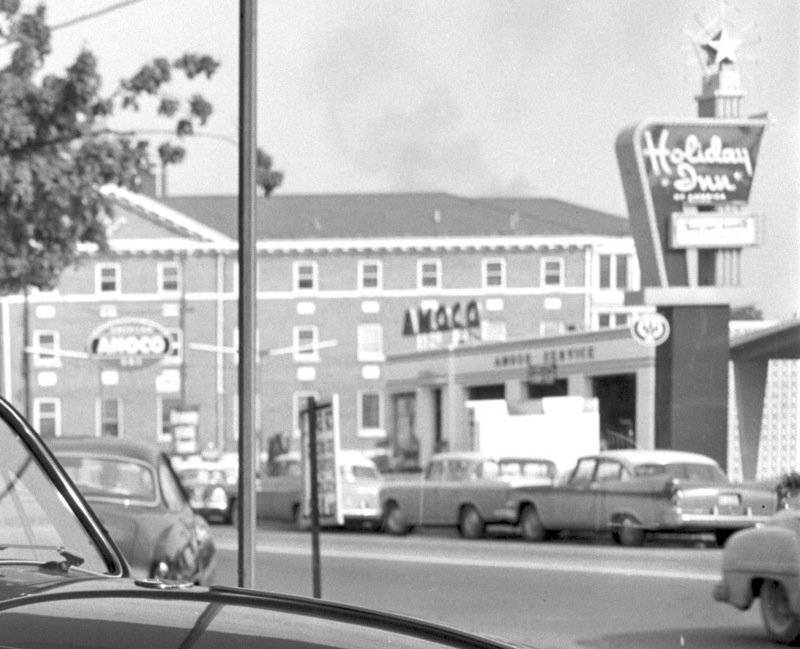 What is the three-story brick building in the background of the 1960 photo? Was it where the police department parking lot is now? It's worth pointing out that this convenience store is the bomb; I stop there at least twice a week for cigarettes on the way to work in RTP. In an age of shiny happy BPs ("Family Fare") and soulless Exxons, this place is a gem. On most Monday nights the clerk is spinning tunes that he mashed up himself, and they have an impressive collection of hip hop apparel and off-brand pork rinds. Plus they sell kerosene, which can be hard to find. I once stopped in there at 5am in full camo gear on my way to a dove hunt in Duplin County. The clerk from Nigeria (i can't recall his name) regaled me with crazy stories of big game hunting in Africa, and not of the "rich men in Land Rovers" variety. More like "this rhino trampled my crops and killed the third goat in as many months, so me and my cousins took after him with our 20-yr old 7mm rifles that hadn't been used since we were in the army". I'm not super excited about this change either. From the looks of their other projects...we may be getting a future eyesore. That location would have been great for a sustatainable project that mirrors the apartment building across chapel hill street and a real boost to downtown living. Thanks -- I finally managed to find the post again and read up on it. I'm fairly new to Durham, but love using Open Durham to find out what the place used to be like. I love seeing the old photos. 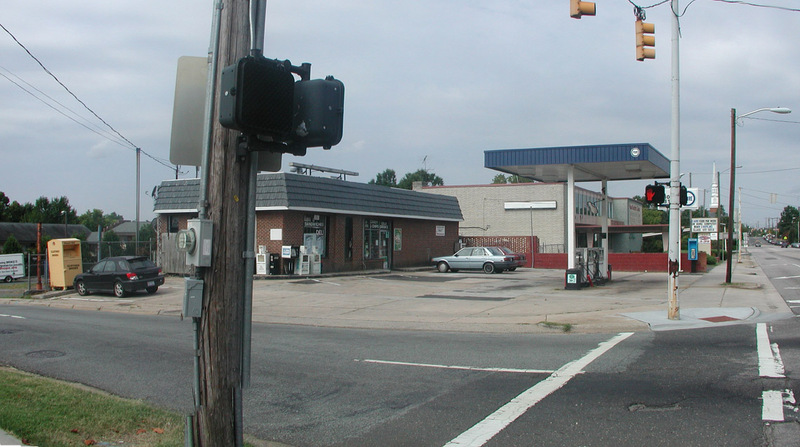 This 1950s era Amoco station received a ~1970s treatment of brick veneer and a shingled projecting roof; it was a pretty junky convenience store / Pure Oil gas station from the time I moved nearby in 1997 until 2012. (Although the practice of the winos imbibing beer in the parking area on the side of the building abated after Temporary Quarters closed. As an aside, I called the police at one point to complain that a man was, once again, passed out on the sidewalk. The officer kept asking me "where? where? Getting a bit frustrated after ~3-4 explanations, I said "Right outside your window." This site was purchased in 2012 by EDR, a Memphis residential apartment developer. 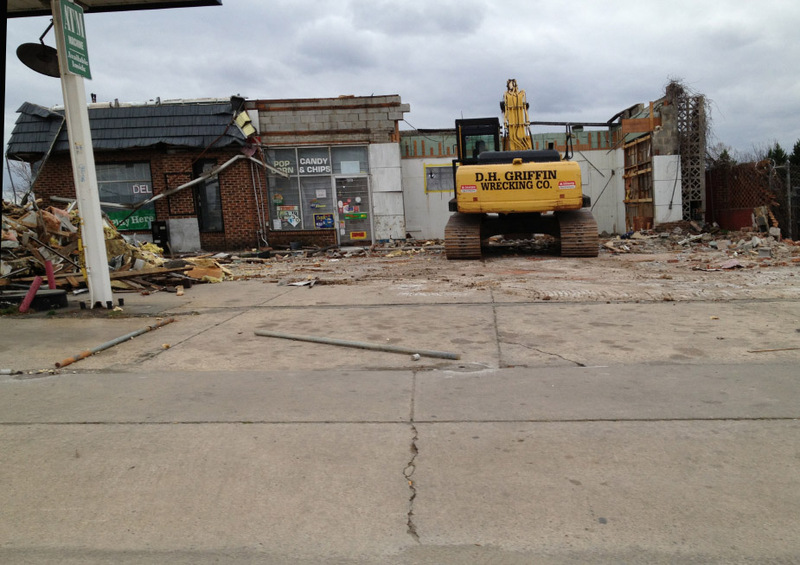 Demoltion began in February 2013. Education Realty Trust, or EdR, is a Memphis, Tenn.-based publicly traded company. EdR is partnering to build a [$46.1 million] apartment community in Durham through a joint venture with the Washington D.C. real estate investment and development firm Javelin 19 Investments. The plan is to build a 386-bed project on property across from the Durham police headquarters. The project is proposed to include studio apartments as well as one-bedroom and two-bedroom units. In addition, there will be an attached parking garage with 400 parking spaces. The apartments are designed to appeal to Duke University graduate students and upperclassmen, according to a news release. EdR is planned to own and manage 90 percent of the joint venture, and will provide development, construction oversight and management services for the project. The project is expected to be completed in the summer of 2014. Rendering from South Gregson and West Chapel Hill, looking southwest.